Sitting at work watching the clock? Running around with endless errands? Is your mind wondering off into how nice a getaway to the woods and mountains would be? Well here we have it for you! Our lodge can accommodate up to 6 people who are looking ONLY to enjoy the beauty and relaxation the Four Stone Lodge has to offer. This lodge sits on a pristine piece of land. There are lots of areas to explore endlessly including a waterfall. There is a community trail to take leisurely hikes and enjoy the scenery. As you come up the driveway, you will feel at home. The bathrooms are modern and bright with updated touches. The kitchen has newer appliances as well all of the pots, pans and dishes you could want to cook up a meal after a long day exploring. Two bathrooms and three bedrooms leave room for everyone. Fresh linens and towels are provided by us to ensure that your stay is as great as it can be. After returning to the lodge, you can fire up the wood stoves which puts out a lot of heat. The stove creates that woodsy lodging vibe that you hope for when planning a getaway in the woods. Sit around the table or the living room with family and friends, enjoy each others company. Peer out the giant floor to ceiling windows and you'll be staring out onto the luscious green timbers. The wood paneling all throughout the lodge gives guests that warm and cozy feeling of getting away beneath the woods and amongst the mountains. Cabins sprinkle the area and elk wander the meadow coming right up to our door. You can sit back and relax. Enjoy our warm wooden stove, barbecue on the deck and drift off to sleep in the comfy bedrooms. 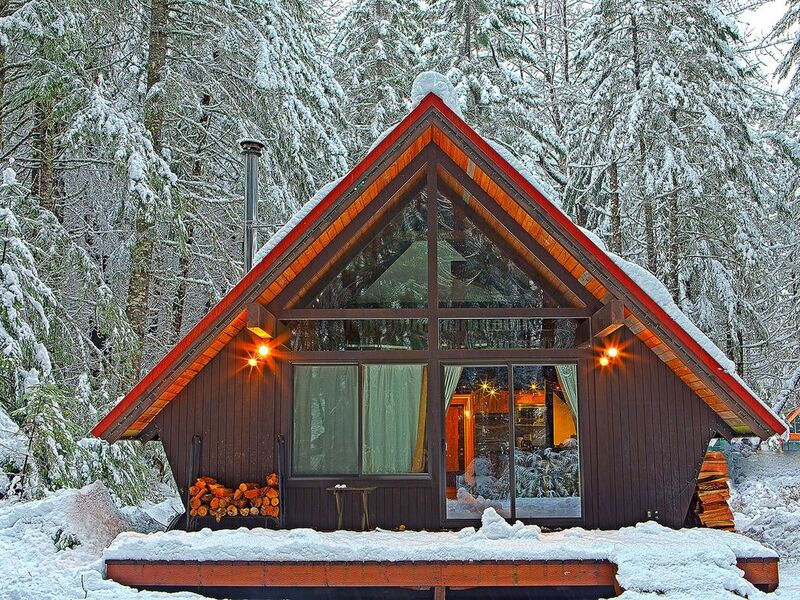 If you love to ski in the winter and be out of doors in the summer you will love our cabin for the same reasons we do. Our kids are just the age for enjoying all the ski runs at Crystal Mountain and, we must admit, we the parents do to. Crystal is the state's largest and (we think) best ski area. Being on the river's edge makes for fun in the summer and there is a nice path where you can stroll up and down the waters.